We all have different places in the racial hierarchy. But we can still work together for justice. By “them,” he meant his Indian immigrant landlords, who had a lucrative deal housing families in vermin-infested rooms with broken toilets and no refrigerators for months at a time. I finally said something about how angry injustice made me. And I thought about the difference between Aaron and me for the next twenty years. For much of that time, I helped build multiracial community organizations across the country. At the beginning of my career, I’d often tell diverse groups of people, “We’re all in the same boat”—that is, we’re all hated by the same people, and our fortunes will rise or fall together. This rhetoric resonated, at first. For a couple of years, members would focus on their commonalities rather than their differences. But eventually, fissures would emerge, usually over the benefits of our organizing. Whose demands got priority? Whose social networks got the most attention? Who got the few organizing jobs that our groups generated? I came to realize that the “same boat” argument didn’t hold up. Racial hierarchy is not a binary in which all whites occupy the lead boat and all people of color occupy the one left behind. Instead, it’s a ladder, with groups occupying different rungs of political, economic and cultural power. The gaps between rungs can seem minor—a few cents on the dollar at work, a few blocks’ difference in where you’re able to live—but to those who are affected by them, they don’t feel like being in the same boat. And blacks often find themselves on the bottom rung. This is not to say that there isn’t plenty of discrimination directed against Asians, Arabs, Latinos and Native people. But studies revealing the depth of anti-black bias abound—basically, people would prefer almost anyone other than blacks as neighbors and employees. Racist ideology relies on maintaining hierarchies, and these hierarchies play out in our own political spaces, too—even when we intend the opposite; even when we think we’ll be immune because we’re people of color ourselves. Groups that can deal with the notion of racial hierarchy, even as it applies among and between people of color, are most likely to have significant black participation too. Groups that are multiracial except for black people have the ability to self-correct. Both the Restaurant Opportunities Centers United and the National Domestic Workers Alliance had few African-American members in their early years (although the NDWA always had lots of black immigrants). In the restaurant industry, blacks were relegated to fast food, not the high-end restaurants on which ROC United focused; in domestic work, immigrants dominated the workforce. But both groups made significant changes to bring blacks in. ROC United focused on discrimination, deprioritizing several potential campaigns that didn’t address discrimination against black workers, until it found a pattern of anti-black hiring combined with wage theft at Darden Restaurants, which owned Red Lobster, Olive Garden and the high-end Capital Grille. The NDWA, meanwhile, started an Atlanta chapter, whose membership is entirely black. Yet involving African-Americans in progressive movements isn’t always about their joining something multiracial. Organized black communities are critical to multiracial power-building; they deserve much more support from the progressive infrastructure. 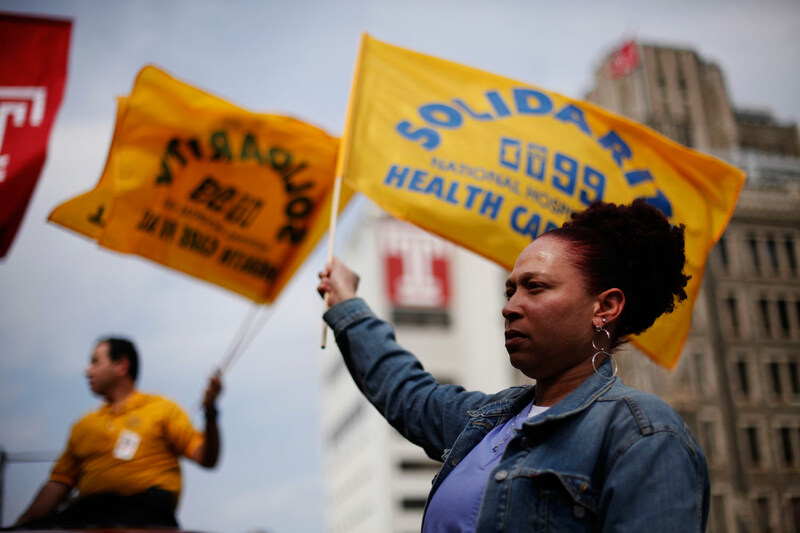 An exciting development in the workers’ center movement is the growth of workers’ centers and campaigns that centralize the leadership of native-born blacks. Groups like the Los Angeles Black Worker Center, the Workers Center for Racial Justice in Chicago and One Voice in Mississippi organize black communities to win access to construction jobs as well as policies that prevent employers from asking about convictions in the application process. After the 1970s, much black organizing energy was redirected into administering the victories of the civil-rights and Black Power movements. While vital, this meant a focus on protecting wins, not maintaining a movement. That’s why the organizing by black millennials that Mychal Denzel Smith explores is so important: it changes the equation of power. There is no contradiction between the desire to build a multiracial movement and the desire to organize black folk specifically. We are all one race or another, and we must be explicit about each community we include. Differences are going to emerge. Knowledge of those differences can be a source of clarity and strategy, if we are brave enough to see them as such.